Chelsea winger Eden Hazard will not travel with the squad to Greece ahead of the opening game of their Europa League campaign against PAOK Athens. The Belgian midfielder has been fantastic at the start of the new Premier League season, scoring 5 goals and contributing 2 assists as the Blues have stormed to the top of the table. Hazard hit a stunning hat-trick against Cardiff City during a 4-1 victory for Chelsea on Saturday and seems to be playing the best football of his career at the moment under new boss Maurizio Sarri. The Italian coach has given the talismanic attacker a new role in the team which has allowed him to express himself more freely and it is already paying huge dividends for the club. However, according to The Telegraph, Sarri is unwilling to risk his star player’s fitness heading into a busy schedule for the team, starting with a Europa League group stage tie on Thursday night in Athens. Hazard will not be included in the 59-year-old’s squad for the match, which means he will get some extra time off before Chelsea’s next league game against West Ham on Sunday. The Telegraph reports that Sarri will make several changes to the team which started against Cardiff, with Ross Barkley, Ruben Loftus-Cheek and Gary Cahill all in line for starting berths. The Europa League fixture list is gruelling and leaves little time for rest between domestic games, which has derailed many a title challenge for top English clubs over the last decade. 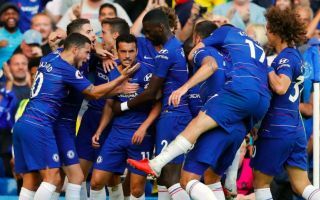 For Chelsea to avoid a similar fate, squad rotation is an absolute necessity and could provide other players with the perfect opportunity to stake their claim for a regular place in the starting line-up. Blues supporters will be hopeful that whatever XI takes the field on Thursday, the team can produce another victory to keep their early season momentum going, as they bid for silverware on all fronts in the coming months.